Recollections of struggles in the years around the First World War - by a former Australian Wobbly. The growth and activities of the I.W.W. - Industrial Workers of the World - in the U.S.A, were being closely watched and reported elsewhere, especially in English-speaking countries, and soon gained many supporters for the I.W.W., particularly among transport workers and seamen. The same idea was being preached all over Europe as 'Syndicalism', especially in France, where the idea of sabotage was openly advocated after its successful application by the electrical unions in Paris. Syndicalism was the main subject of a street campaign in Melbourne by Percy Laidler and Claude Menzies, who bravely carried on open-air propaganda for three years or more. 'Chummy' FIeming, a Fitzroy cobbler, advocated anarchy from a stump on the Yarra Rank - 'No God, no Flag, no Master!' - to the disgust of many staunch Catholics, to whom he referred as 'Fatty Carr's Lambs'; Carr being, at that time, Roman Catholic Archbishop of Melbourne. Anarchism was also preached from a stump in the Sydney Domain by an Austrian, Dr. Xarus Sphinx, and his son. The four or five years preceding the 1914-1918 war were noted for the vigour and scope of labour unrest in the Western World. Periodic unemployment, with its attendant poverty, was a universal part of the scene. Notwithstanding this, there was more freedom for street meetings, and for the printed word, than there has been ever since. The I.W.W. political branch got a 'local' going in Sydney in 1912. G. G. Reeve was secretary, but little progress was made. I was in Melbourne from 1910 to 1914. Bob Ross came over from Broken Hill and was made secretary-organiser of the Victorian Socialist Party, which had a rival in the Australian Socialist Party. They conducted regular street corner meetings at nights and on Sunday mornings at which the labour movement of the world was discussed and explained. They would allow others to use their platform and address their meetings. Jack Gain was one of their speakers. Bob Ross organised Sunday night meetings at the Bijou Theatre. These were a great success and he succeeded in getting a number of brilliant speakers to address his meetings: Joseph McCabe (Religion); Professor Osborne (Science and Evolution); Baldwin Spencer (Aboriginal Lore); and many fine political speakers, debaters and a few good Marxian economists. Among others, I remember John Curtin speaking there. He was then editor of Labor Call and, I think, secretary of the Timber Workers' Union. Thus it was that Bob Ross helped to educate some who later became prominent politicians. Among the regular Australian open-air meeting places was Port Melbourne Pier. A meeting was held there regularly every Sunday morning and there was always a fair crowd to hear the speakers and to procure the printed pamphlets - some purchased, some donated free. Cain was a frequent speaker there. This spot was a terminal or turning point for weekend traffic - pedestrian, horse, or horse and sulky - which promenaded on fine days from St. Kilda via South Melbourne Beach. Many of these people would tarry awhile and listen to some speaker who was holding a good crowd. One Sunday morning a Socialist Party speaker invited an interjector to mount the stump and have his say - a common practice in those days. Rudolph Hamilton Matthias mounted the stump and spoke for the I.W.W. and its policy of direct action in preference to political action. He was a fair speaker and his speech caused much discussion and dissention in the A.L.P., the Socialist Party and the trade unions. By this time, the policy and pattern of the I.W.W. was becoming well known and debated in Australia and New Zealand. The organisation in the United States had done much work through lectures, pamphlets and open-air meetings. It had much success in fighting for the right of free speech though thousands had to suffer jail sentences to win it. They also got mass publicity for Margaret Sanger's work on birth control and made a mockery of its legal prohibition by distributing over a million copies. They also indicated that where laws were against the interests of the working class they would fight them. The organisation was also active in raising funds for the defence of working-class speakers and others on trial for working-class activities. Yet the I.W.W. at that time had no industrial organisation beyond the itinerant agricultural workers whom it successfully organised in the harvest fields of U.S.A., which were worked seasonally by a standing army of so-called hoboes epitomised as the flock of the old 'preacher' in Steinbeck's 'Grapes of Wrath'. To these the principles of the I.W.W. made a very strong appeal. From among these 'hoboes' there emerged some extraordinarily able men: among others, Vincent St. John, who wrote 'An Appeal to Wage Workers' - of its type a little masterpiece; Joseph Hilstrom[Joe Hill], who wrote most of the very witty and topical songs of the I.W.W. With others, both later gave their lives to the cause. The I.W.W. plan had escalated into a design for all workers in any one factory, or any one project, to belong to one local - all like locals to form an industrial union. Industrial unions then to form into six Industrial Departments, and these to be represented by an elected Central Committee. This committee would, in effect, constitute a cabinet of the working class as opposed to the usual cabinet, the members of which are selected, if not elected, by the capitalist class. The locals, being actually only propaganda centres, financed their activities by dues, which were very light, and by sales of their newspapers and pamphlets. Kerr & Co.'s first-class small reprints of such works as Karl Marx's Value, Price and Profit were all retailed at threepence. These were sold in bulk to locals for roughly one-third or one-quarter of that price. Capable organisers were often supplied with stocks of literature at wholesale prices by the local. Sometimes they were given free. In this way the sales of literature financed some of the speaking tours. The amounts were always announced at meetings at which collections were taken and all monies were scrupulously accounted for. It was against principle to amass funds - any surplus over immediate necessity being spent on improved meeting hall accommodation, printing presses, organised tours, or for assistance to industrial causes such as strike funds, etc. Further, this plan eliminated the possibility of loss by raids or theft. Acute emergencies were met by loans, appeals to members, and the regular collections at public meetings. If needs must when the devil drives, then that gentleman never failed us. Throughout its entire existence all wage workers were eligible to become members of the I.W.W. without distinction, industrial or social; and all decisions were made by majority vote. I joined early in 1915 - the same night as Fred Morgan, a Welsh 'Son of the Manse'. Together we worked on the wharves and together we trod the hungry mile in Sydney. Fred learned linotyping and soon became very active and effective on the publishing side of the organisation. Around this time a private syndicate created a stir in Australia by releasing forged £5 Commonwealth banknotes throughout the country and many of them got into circulation. It was thought by the authorities that Fred had in some capacity or other become enmeshed in the venture. If he was, I am unaware of it. In any case, he was one of several for whose arrests warrants were issued. He became 'missing' and has remained so ever since. On account of Morgan's activities with the I.W.W., the Commonwealth authorities were quick to seize on the opportunity to try to link up the forgery with that organisation. One new Journal - a weekly, I think - I've even forgotten its name - published a full-page article in which it purported to have unravelled a gigantic plot by the I.W.W. to disrupt Australia's finances and dampen the war effort. One can well imagine the warm approval of this type of guff by the Commonwealth authorities, who were seeking to dissolve the I.W.W. on any excuse that would not arouse too much public suspicion. Quite naturally, the 'journal' in question, spawned in the foetid war atmosphere that pervaded the country at the time, gasped out its swan song when the miasma which nurtured it had, to some extent at least, cleared with the termination of the war. I attended meetings at the I.W.W. Hall; took a hand at setting out and producing the paper, 'Direct Action'; did some proof reading and made an occasional translation from French papers. We received copies of many foreign labour papers, and sent our own paper overseas. The bulk of our membership was composed of bush and construction workers who travelled by necessity. When two or more members found themselves on a job together they organised study and reading classesall workers welcome. We used Value, Price and Profit, or some such work on economics, and maybe some other good type of book with a popular appeal. The method would be to assemble in a private tent or camp. Each man might read a few paragraphs and then pass the book to the others in turn. Difficult passages were always a subject for discussion until the matter was clear to all. of speech and thought undreamed of a few months - in some cases even weeks - earlier. 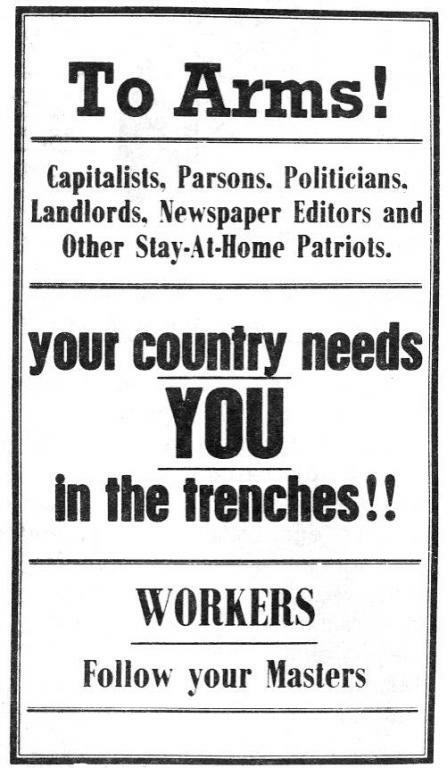 By 1915 the war was gaining momentum and the need for recruits became more urgent. At this time a drought in Victoria and New South Wales led to vast unemployment, which in turn bred a small army of swagmen. These were severely harassed by country police, who were encouraged by the 10s. per head they received for those they recruited. As I ponder over this, I become reminiscent of the accounts of blackbirding on the old American windjammers. Landowners, graziers and many other employers held periodic recruiting campaigns and then replaced the recruits from the ranks of the unemployed who, in turn, were later subjected to another recruiting campaign. And so the vicious circle went on. Travesty! Irony! Call it what you like - men recruited from the social depths to fight for the continuance of the system that put them there. Among other works at that time, a big railway construction job was using mostly part-time workers. These were culled from the city and country unemployed of every trade and calling who were used for navvying work on the deviation and duplication of the Southern Railway. Tile camps often comprised two or three hundred men - many with wives and children. The result was that small hessian and canvas towns appeared along the line. The hessian 'mansions' were mostly fabricated from used cement bags. Also all tents were supplied by the workers themselves. When trains containing new recruits passed along the line there was usually an exchange of banter, some liberally spiced by abuse, between the soldiers and the workers. With the passage of time these exchanges became more hostile. The recruits amused themselvs by throwing rubbish and empty bottles at the navvies who, in turn, menaced every passing recruit train by standing at the ready, armed with stones. If the train passed peacefully all was well; but if there was any nuisance from the recruits the train was well bombarded with 'goolies'. Only occasional personal damage was done - the main casualties being the windows. The atmosphere was extremely friendly between the workers and the unemployed. The workers well knew that they were liable to be unemployed themselves at any time from week to week, or even day to day. An unemployed man walking through a railway cutting to find the ganger and seeking a job would most likely be hailed by some of the navvies working in the cutting and have a few shillings, or perhaps a packet of cigarettes or tobacco, thrown to him. In the camps all navvy boarding houses would give a meal to an unemployed man or face the probable loss of their boarders next payday. This was also an A.W.U. rule. In the cities the question of conscription was being raised everywhere. The 'yellow' press, of course, aided and abetted by a horde of public speakers, were advocating it; but on industrial jobs there was a solid body in opposition; and this body was growing. During 1915 the I.W.W, meetings in the Sydney Domain had been attracting larger and larger crowds and, in ratio, bigger collections and many new members. The propaganda paper, Direct Action, was growing in circulation and covering a wide area of the country. This stemmed from the fact that I.W.W. members were the most travelled section of tire working class. The American papers 'Solidarity' and "The Industrial Worker' also circulated freely and contained news from all countries of industrial activities and strife; also articles by authoritative writers, on economics and politics. In addition, Kerr & Co.'s publications were widely circulated and studied. In the Sydney Domain there were conscription and anti-conscription meetings every weekend. A mob of soldiers had been incited to interfere at the anti-conscription meetings. They started breaking up the meetings and in successive weeks broke up meetings of the Socialist Party, Socialist Labor Party and the Australian Labor Party. Then came the turn of the I.W.W. On this particular Sunday the I.W.W. had attracted a very large and enthusiastic audience, which included many soldiers. The pro-conscription soldiers charged at the audience and were met by solid resistance. The soldier-mob reformed and rushed twice more but were driven back and sustained a few casualties. The main weapons were fists and umbrellas. The anti-conscription soldiers in the audience acquitted themselves well, as did a number of well-set-up civilians, with the result that some twenty or thirty of the pro-conscriptionist soldiers were treated at the nearby Sydney General Hospital. The pro-conscription soldier-mob then dispersed. Police reinforcements arrived and read the Riot Act; and the I.W.W. meeting closed down. That night, and on several later occasions, similar mobs of reactionary soldiers assembled and marched towards the I.W.W. Hall in Sussex Street, threatening to wreck it. As a counter-measure, many soldiers volunteered to defend the I.W.W. One night a menacing mob of pro-conscriptionist soldiers marched down Goulburn Street, on mischief bent, towards the I.W.W. Hall. For safe conduct they were shepherded by mounted police. En route a civilian slipped into the ranks of the marching soldiers and threw a stone which struck a mounted policeman, whereupon the mounted police drew their batons and assailed the soldiers, who fled in all directions. Was ever the biter bit! In Sydney a strike of soldiers in the camps led to rioting. Nonpayment of fares on trams and trains and other militant activities added to the general excitement at the time. At this time W. M. (Billy) Hughes held a conscription meeting in the Sydney Town Hall. This was effectively countered by an anti-conscription meeting held there soon afterwards. The turning point of the conscription issue was definitely the result of the rout of the reactionary soldiers in the Domain. In the preceding week anyone speaking against conscription in hotel, restaurant, train or any other public place received only a lukewarm reception. But after this incident the case for conscription grew cool, and in some places actually frigid, while the case against conscription was warmly approved - as the Referendum poll later proved. was the printer and publisher of the I.W.W, paper, Direct Action, and other propaganda sheets. This savage sentence aroused much public indignation - even in circles that could not, by any stretch of imagination, be called working class. Many wild threats were bandied about as to the extent of the action that would be taken to secure Barker's release. The press annnounced that some pooh-bah had received an anonymous telephone call saying 'Release Barker or Sydney will burn.' One can only guess at the origin of this statement - suffice it to say that it was certainly well timed, opportune and convenient, in view of the fact that just then there was an outbreak of fires in Sydney - and some were big and spectacular. Here was a way out for firms whose outlook was bleak and for those whose ship was about to crash on those cruel rocks known as 'Recession', 'Business Slump', or some other convenient name. To the question: 'What caused these fires?' the reply was tailor-made, unquestioned, and even anticipated - the I.W.W. So generally accepted was this solution, that Insurance Companies had no alternative but to pay up, although the suspicions of one Insurance Inspector led him to become 'so unreasonable' as to suggest that the fires were 'inside jobs' - the result of a business slump. In certain quarters these fires were a double-barrelled bonanza, for they presented a political as well as a business opportunity. The Government of the day saw in them the 'open sesame' for the breaking up of the I.W.W. The result was the 'trial' and barbarous sentencing of twelve leading I.W.W, men, and thus the virtual breaking up of the organisation. The sentences varied from five to fifteen years. The 'trial' stank to high heaven. One of the 'gems of justice' at the 'trial' was the piece where a detective stated on oath that he saw Charlie Reeve acting in a suspicious manner outside Winn's Department Store in Oxford Street on the night that the store was burned down. Reeve, at the time, was serving a sentence in Long Bay Jail for selling the I.W.W, paper, Direct Action, on the streets. When the Comptroller-General of Prisons was called by the defence and gave evidence that Reeve was in jail on the date in question and could not possibly have been at the scene of the fire, the judge suavely remarked: 'Well, if he wasn't there at that time he probably was there at some other time.' Surely this ranks as the piece de resistance of justice in this or any other country. Some of the so-called barbarous African States of the period would have exonerated Reeve and indicted the detective for perjury. The judge certainly knew what was expected of him at the 'trial'. A Defence Committee for the twelve men was immediately set up, and it functioned and held together for four years, largely by I.W.W. 's George Washington and Jago. The culmination of its heroic struggle was the appointment by the Government of a Royal Commission to investigate the 'trial' of the twelve men. Royal Commissions do not use such mundane terms as 'frame-up', but they found that the 'trial' was not quite in order and that the men had been wrongly imprisoned. They were immediately released. There was no 'compensation', but each man received about £50 from the defence fund and some unions, including £5 a head from Queensland meat workers with a strong letter from the secretary of the Alligator Creek Workers. The Government that had falsely imprisoned the twelve men had been thrown out of office by the electors in the meantime and the succeeding Government (Labor) had bowed to union pressure and the weight of public sentiment in setting up the Royal Commission of Inquiry. The twelve men were: Thomas Glynn, Donald Grant (later a Senator in the Commonwealth Parliament), William Beatty, John Benjamin (J.B.) King, Peter Larkin, Robert Besant, Charles Reeve, Donald McPherson, William Teen, Thomas Moore, Jack Hamilton and Morris Fagin. Almost all of them have now passed away. None of those who have passed on was very old - their span no doubt being shortened by the rigour of the years spent in jail. Of the twelve, I think Jack King was the eldest and Bob Besant the youngest. Bob died, a comparatively young man, not long after his release. The total I.W.W. membership enrolled was 55,000, but the financial membership never exceeded 11,000 at any one time. However, the organisation wielded an influence in trade union circles out of all proportion to its numbers. This was due mainly to the simplicity of its policies and its apt and lucid statement of prevailing conditions. For instance, during a strike, a big camp of shearers in Moree (N.S.W.) asked the LW.W. for assistance. The organisation immediately collected funds in Sydney and Jack (J.B.) King was sent to Moree where, with the assistance of some local I.W.W. men, he piloted the shearers to victory. To augment King's efforts Sydney Local printed thousands of stickers in colours. They were effective and added spice to the strike campaign: 'Don't scab on the Shearers - Let the Blowflies win the Strike', and another: 'Fast Workers die young. Someone has to be last - Let it be You'. Men with these ideas, of course, did not last long on jobs, with the result that they and their stickers soon became dispersed and circulated all over the continent. The period 1913-1918 was peculiar in that there was a more widespread ferment throughout the world working class, particularly among its lower ranks, than for many years. Science had begun to popularise its findings, and its methods and reasoning had challenged those of all previous economic and religious dogmas in no uncertain manner. This, added to the threat of conscription, led to the wide acceptance of the I.W.W. "The working class and the capitalist or employing class have nothing in common. There can be no peace between them as long as millions of workers are in want, while their exploiters live in affluence." "The concentration of capital is bringing the control of industry into fewer and fewer hands, and the trade unions are powerless to counteract this. These conditions can only be met by an organisation formed in such a way that all its members in all industries would cease work in the event of a strike - thus making an injury to one the concern of all". Instead of the outmoded conservative motto: 'A fair day's work for a fair day's pay', the I.W.W. banner carried the revolutionary slogan: 'Abolish the wage system'. The programme was: `Agitation, Organisation and Emancipation'. The only really relevant evidence was Scuny's statement that he visited the house where Teen, Fagin and Beattie lodged and had discussions about I.W.W matters with them. That they also concocted fire making stuff for which he supplied the materials is absolutely untrue. The only support for this story was that when Teen was arrested a 'demon' put his hands in Teen's overcoat pocket; when he pulled it out he had a parcel in his hands. [2.] The above is not verbatim, but is a close approximation and a fair summary of what should be included in any history of the founding and activities of the I.W.W.